To include epistemological questions concerning the validity of sociological knowledge in the sociology of knowledge is somewhat like trying to push a bus in which one is riding. To be sure, the sociology of knowledge, like all empirical disciplines that accumulate evidence concerning the relativity and determination of human thought, leads towards epistemological questions concerning sociology itself as well as any other scientific body of knowledge. As we have remarked before, in this the sociology of knowledge plays a part similar to history, psychology and biology, to mention only the three most important empirical disciplines that have caused trouble for epistemology. The logical structure of this trouble is basically the same in all cases: how can I be sure, say, of my sociological analysis of American middle-class mores in view of the fact that the categories I use for this analysis are conditioned by historically relative forms of thought, that I myself and everything I think is determined by my genes and by my ingrown hostility to my fellowmen, and that, to cap it all, I am myself a member of American middle class? What is your research paradigm? The Oxford English Dictionary defines the basic meaning of the term paradigm as “a pattern or model, an exemplar”. In terms of your own research, paradigm means the way of examining social phenomena. Burrell and Morgan (1982) suggest a taxanomy of four different paradigms as a result of crossing two variables: objectivism/subjectivism and radical change/regulation. Radical change refers to the fact that the organization studied must be conducted by mean fundamental changes to the normal order on things, while regulation perspective is less judgemental and critical. In the bottom left corner of the quadrant is the interpretative paradigm. You still would be recommending non-radical changes but through an explanation based on irrationalities or, in other words, trying to understand the meaning that humans involved give to the organization. E.g. “the fact that the workers at customer service do not get on very well is affecting the quality of the service and it requires to be improve by mean organizing more social events”. 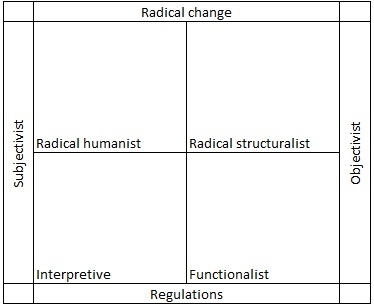 In the top left corner the radictal humanist paradigm is located within the subjectivist and radical change dimensions. The needs of radical changes in the organization would be based on “feeling researchers-like” perspective, i.e. interpretativist perspective. E.g. the lack of motivation among customer service workers means that it must disapeared or being integrated in marketing department in order for workers have more challenging jobs. Author Xaquin S. Pérez-Sindin LópezPosted on November 20, 2012 April 16, 2013 Categories Philosophy & approachTags functionalism, interpretativism, positivism, radical humanism, radical structuralism, research paradigm, social phenomena, statistical analysisLeave a comment on What is your research paradigm? Are you forced to assume a philosophy for your research? If after reading the previous post on positivism and interpretativism philosophy you think that choicing one or another is still unrealistic in practice you might be interesting on adopting the view of pragmatism. This view argues that more important than the research philosophy is the research question. The pragmatism view also argues that is perfectly possible to work with combination of “resources” and “feeling” researchers´ views, as well as the combination of both objectivist and subjectivist philosophy. Consequently, it mixes methods, both qualitative and quantitative, something which is, actually, very recomendable. Tashakkori and Teddlie (1998) suggest that it is more appropiate for the researcher in a particular study to think of the philosophy adopted as a continuum rather than opposite positions. Tashakkori, Abbas, and Charles Teddlie. Mixed methodology: Combining qualitative and quantitative approaches. Vol. 46. Sage Publications, Incorporated, 1998. Author Xaquin S. Pérez-Sindin LópezPosted on November 20, 2012 April 16, 2013 Categories Philosophy & approachTags feeling, interpretativism, objectivism, philosophy, positivism, Pragmatism, research philosophy, resources, subjectivism1 Comment on Are you forced to assume a philosophy for your research? As researcher you are creating new knowledge. But, what is or not knowledge for you? Two main views may be adopted. “Are you very satisfied, somewhat satisfied, neither satisfied nor dissatisfied, somewhat dissatisfied, very dissatisfied within the company? These “resources” researchers would argue that this kind of data is less open to bias and therefore more objective. They think that the object studied by the “feeling” researchers cannot be seen, measured and modified like computers, trucks and machines. But, does this data presented in statistical tables deserve more authority than those presented in a narrative by a “feeling” researcher? You may be critical of “resources” researchers view and argue that the social world of business and management is far too complex to be understood just by numbers. “Feeling” researchers advocates that it is necessary for the researcher to understand differences between humans in our role as social actors. Before further explanations of what is a social actor, watch the below video. This video, emphasize the importance of the context, i.e. how important is where we are to the way we behave. Many of the people passing by the famous violinist would have paid more than 100$ for attending one of his concerts, but in this precise context, not even stopped to listen to him. At the same way, you as students might be making jokes and laughing if you were outside or in a party, but as you have been tough that in a class you are supposed to behave, you don’t make jokes. Because there is something called social norms: being in silence, raise your hands when I ask you for, say good afternoon when entering in classroom, just example of social norms that are not written anywhere but all of us know. Following this social norms we become in social actors, and play different roles depending on the context. A “resources” researcher would think that this is not objective, because you analysis is affected by the context and the answer given by the worker may be biased. On top of that, the number of interviews is not enough and it is not representative of the total number of the workers. The truth is that a “feeling” researcher do not highly focus on “representativity” and “objectivity” as “resources” researchers do, but they gain, by contrast, major deepness in their analysis and major ability to identify the smallest details of worker satisfaction. The metaphor of iceber illustrate very well the difference between both philosophies. 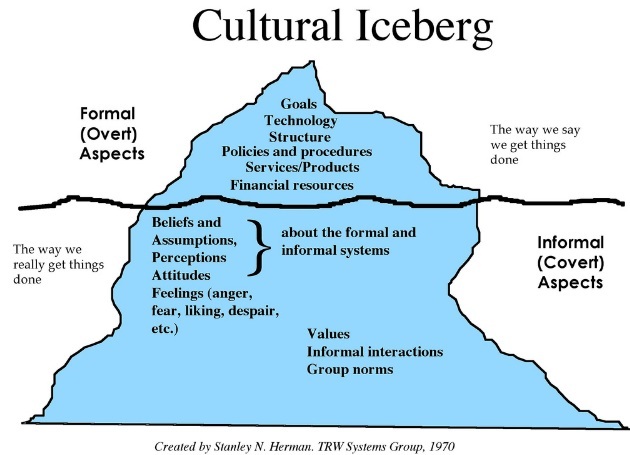 In case of perfoming a research on a company culture, a positivist (“resources” researcher”) will aim to understant the visible part of the iceber, which corresponds with goal technology, structure, policies and proceedures, products/services and financial resources, among other, or what is called formal aspects of the organization. By contrast, a interpretativist (“feeling” researcher) will aim to undertand such questions as beliefs, attitudes and values, among others, or what is called “informal aspects of the organization. Finally, after reading this post you still think that choosing between one position and other is somewhat urealistic in practice, perhaps you should consider read this other post on pragmatism.